How can Bidzpro be of help to B2B buyers? e-Procurement or electronic procurement, the alternative to the manual process of procurement refers to the process of buying and selling of products and services through electronic methods. Knowing its potential to curb irregularities, the salient benefits of electronic procurement have attracted both buyers and sellers, hence, several business groups and organizations are opting for e-Procurement platforms to avoid unnecessary costs, enjoy a great deal of transparency, and to have a betterment that will scale up their business as a whole. However, the B2B procurement process isn’t as easy as it sounds because it has its own opportunities and challenges, but with Bidzpro this is not the case. Our unique online bidding platform helps business in tremendous ways and this blog post is an attempt to bring out the benefits that a buyer can enjoy when using the services of Bidzpro. 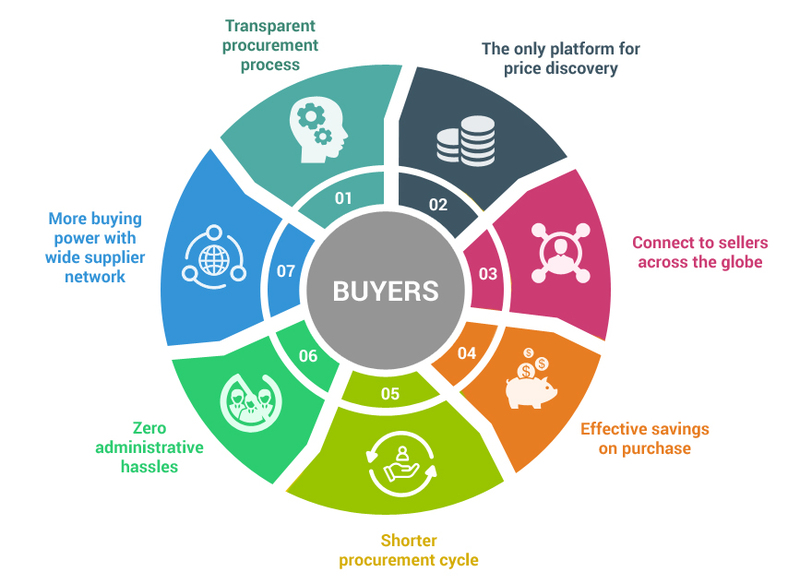 1) Transparent procurement process: Transparency is the key feature of a successful procurement and buyers can have that advantage when fulfilling their B2B buying needs through Bidzpro. This in turn empowers you with the ability to add more strategic value to your company, while still making profitable additions. 2) Price discovery: One more significant benefit that buyers can take advantage of when using bidzpro is price discovery, this empowers you to drive down costs without increasing risk for the business. This will instantly help you know how good a deal is. 3) Buyers can connect with sellers on a global scale: With us, not only you have the benefit of connecting with a large number of sellers, but also have access to connect with sellers on a global scale. By this means, you will have the opportunity to explore more about your buy requirement and the varieties that sellers have to offer you. 4) Effective savings on purchases: This is one of the most important and highly beneficial advantage that buyers can enjoy and it is effective savings on purchase. 5) Shorter procurement cycle: In general, the average buying cycle is normally longer and this is not the case, if you are using the services of Bidzpro. The time-consuming cycles are inefficient in every single way and it can set off significant delays in attempting to connect with both sellers. Shorter procurement cycle is our strong point. 6) Zero administrative hassles: It goes without saying, when you are about to enjoy the aforesaid benefits, it all leads to zero administrative hassles, irrespective of the business you are in. 7) More buying power with wide supplier network: Our centralized supplier database makes things easier, thus, it paves way to standardized procedures and effective management of a wider supplier network. How to discard scrap metal in chennai, Tamilnadu? How to take advantage of price quotes or quick quote? Address : 25, 27, Greams Road, Thousandlights East, Chennai-600 006, Tamilnadu, India. © 2019 Hild Smartech. All Rights Reserved.